Just outside Boulia we came across a few Waddi trees, Acacia peuce, a rare and endangered wattle. Waddi trees have a beautiful weeping form and at first glance are easily mistaken for a Casuarina with their needle-like leaves. Although Waddi trees germinate readily from seed, given good conditions, they are extremely slow growing. They produce a very dense and durable timber – fence posts have been found showing little sign of decay after nearly a century! Given the opportunity, they can grow to a height of 18 metres and live for 500 years or more. The local Pitta Pitta people have had many uses for Waddi tree timber, making weapons, digging sticks and dishes as well as to transport fire by taking small smouldering pieces from camp to camp. All the stands are located on the fringes of the Simpson Desert, but they are separated by hundreds of kilometres. No-one really knows why these populations are so truncated. 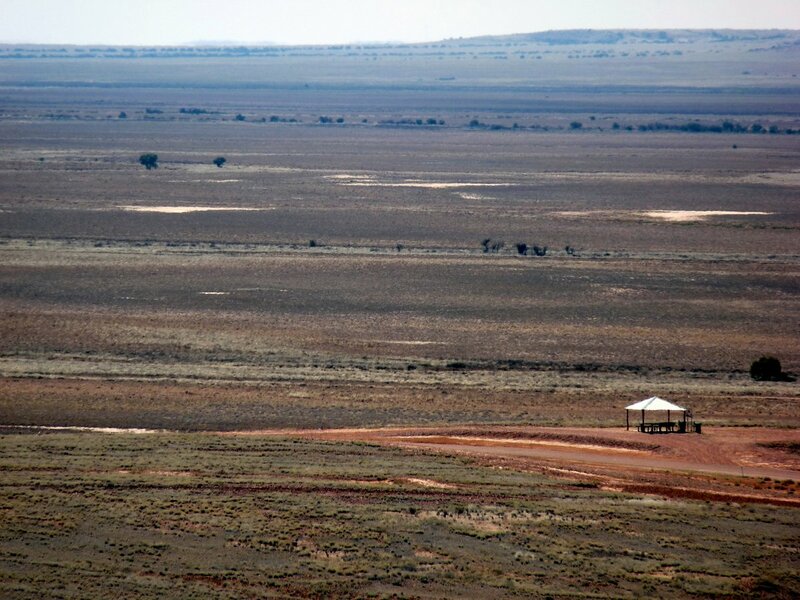 Some theories suggest the stands are relict populations of a once widely dispersed forest that spread across the Simpson Desert. The theory goes that the prevailing winds may have smothered tracts of Waddi Tree forests until only these three localities were left. Another theory is that burning may have reduced the population to its current size, because there’s evidence the trees are fire sensitive. More recently, human incursion into the desert over the past 150 years or so, has also had an impact. Pastoralists, for instance, used Waddi Tree wood to make buildings and fences, sizeable trees in the desert must have seemed a bounty to their eyes. Cattle grazing and introduced species such as camel and rabbit have also had an impact. Waddi trees have now been listed as a protected species on the Register of National Estate. The road from Boulia to Bedourie is mostly sealed, easy travelling although there are not a lot of stand-out features along the way. We did find a picnic shelter by the side of the road in the Boulia Shire but as we’d had lunch we drove on. About 1 km later we crossed into the Diamantina Shire and saw a sign to a lookout on the opposite side of the road. We decided to drive up, and it was up, quite a steep incline to the Vaughan Johnson Lookout where several large notice boards welcomed us to the Diamantina Shire. (which we had temporarily left travelling via Boulia). We then found that we were looking down on the Boulia picnic stop situated on its gentle rise with the road in the foreground. The Vaughan Johnson lookout is larger and has several noticeboards with information on the history of roads in the Diamantina Shire and the close relationship the shire has with Hastings Deering (manufacturer of Caterpillar earthmoving equipment). References: Jacqueline Hodder, PhD candidate from the University of Melbourne talking to Robyn Williams on Ockham’s Razor in 2009. 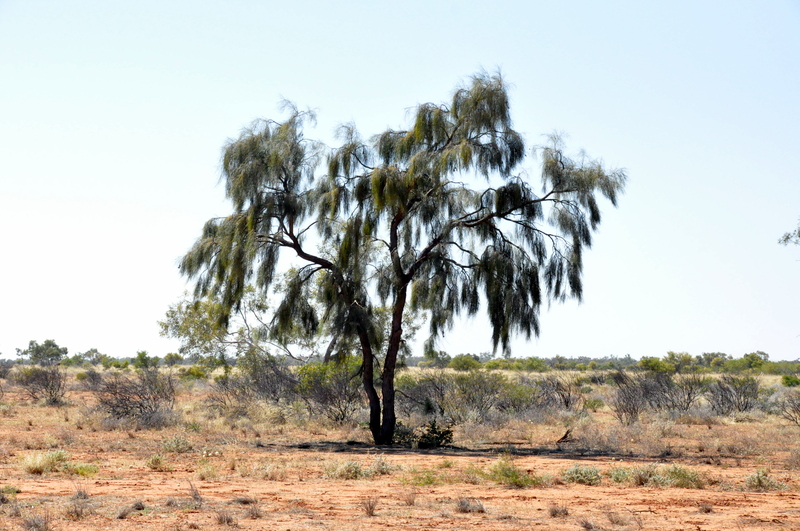 This entry was posted in Excursions and tagged Acacia peuce, Boulia, Waddi tree. Bookmark the permalink.